This is a policy of setting prices close to average cost. It is a way to maximise sales, whilst maintaining normal profits. It is sometimes known as sales maximisation. It will be used by firms who are seeking to increase market share and who don’t seek to maximise profits. Average cost pricing will occur in perfect competition because firms can only make normal profit. However, it will only occur in Oligopoly if firms have a specific goal. In practice it can be difficult to work out a firms average cost. For example, average total cost will have to include not only variable costs but also total costs. 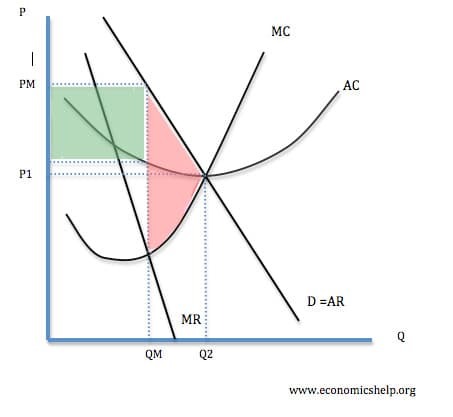 Average cost pricing would be to set price at P1 (output Q2). Monopoly pricing will be at PM.